People who love to take risks often try going without a helmet or wearing no seat belts. This behavior is not a love for risk, it is plain stupidity. Those who love risk drive in difficult terrains, they don’t drive without safety. It is a popular misconception that people at the back seat are safer than ones sitting at the front seat. This following advertisement aims at clearing that misconseption. This is an interesting billboard advertisement launched in public interest in Australia. 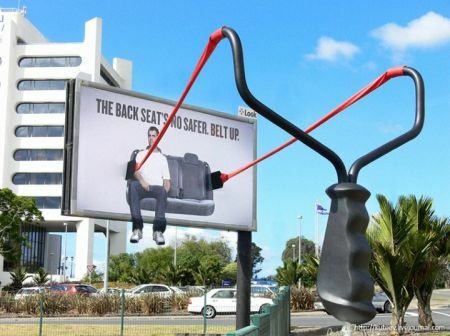 Apparently, the advertisement aims at encouraging youths to use seat belts even if they are sitting on the back seat. The advertisement is showing a person sitting on the back seat of a car that gives an impression that the person can fall any moment. The billboard is attached with a effigy to reflect as a complete car but there is considerable space left between the effigy and the billboard in order to show the gap where a person can land in case of an accident. The advertisement also presents a perfect example of a nice exaggeration of a brilliant idea and its execution. The presentation of the advertisement is quite compelling and engaging that communicates its idea effectively. The copy reads, ‘The back seat is no safer. 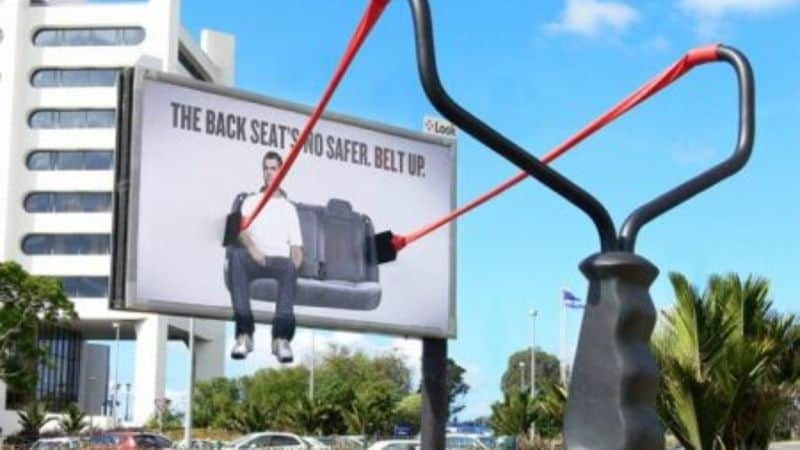 Belt up.’ The advertisement was created by Clement BBDO, Australia. If wearing a seatbelt in your car makes you feel like unmanly and childlike, here’s what you can do to satisfy your lust for adventure. Take a look at these 6 most dangerous roads to drive. Driving on one of these is what one would call adventure. But be sure you wear your seatbelt, even if you are sitting at the back, as most probably you might need it. 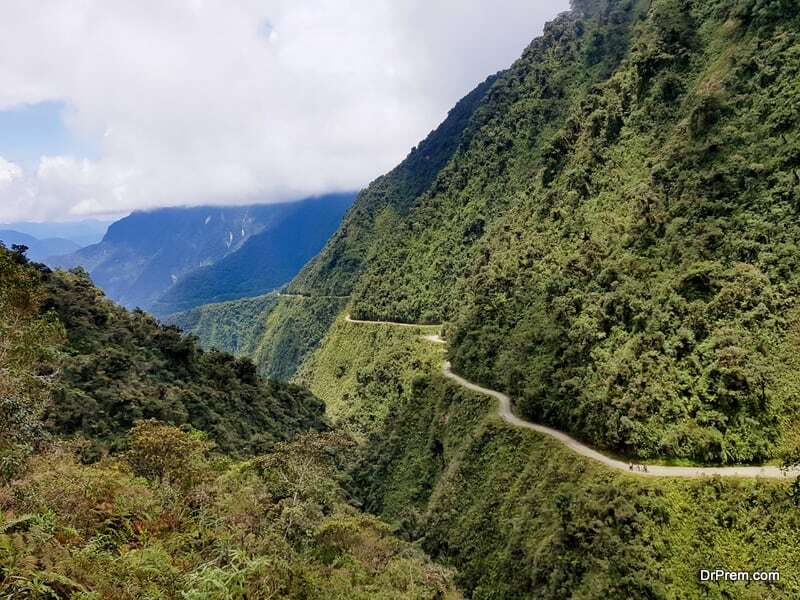 North Yungas Road, popularly known as ‘The Death Road’, is a 40-mile long way spread from Nuestra Señora de La Paz to ‘Corico’ through the stretch of forest ‘Yungas‘, in the blocked-in country of Bolivia. It has been considered as the ‘world’s most dangerous road’ by the Inter-American Development Bank (IADB). The road basically comprises a single lane that is less than 10 feet in width and does not have any guard railings. Furthermore, the weather at this place remains very bad throughout the year due to heavy rain, extreme dust, deep fog, and so on. All these turn the drive through the North Yungas Road into a very dangerous one. Official data shows that almost 300 people have already lost their lives while driving through this connector between the region of Amazon rainforest and the northern part of Bolivia. After the North Yungas Road, it is the Guoliang Tunnel Road of the People’s Republic of China (PRC) that should be included in the list of most dangerous roads in the world. Set in the Taihang Mountains in Hunan, this The 16-ft. tall, 1 mile long and 13-ft. wide dodgy way is the outcome of a 5 year-long effort of local people. It is the one and only road in the country that was opened in the year 1977 to facilitate the transportation in the remote village ‘Guoliang’. The road offers a risky journey to the drivers, especially during the monsoon. The frequent and heavy rainfall, as well as dense fog, shrinks the visibility to a large extent. Therefore, it is always recommended that you enough take safety measures while driving through it. Visit the island country Philippines and it might bring an opportunity to you to drive through the Halsema Highway, one of the most hazardous roads on the earth. Both height-wise and length-wise, this highway has become a major tourist attraction. It is the highest road throughout Philippines having a length of 150 miles and serves the purpose of connecting Northern Luzon with a couple of provinces – Benguet and Baguio. 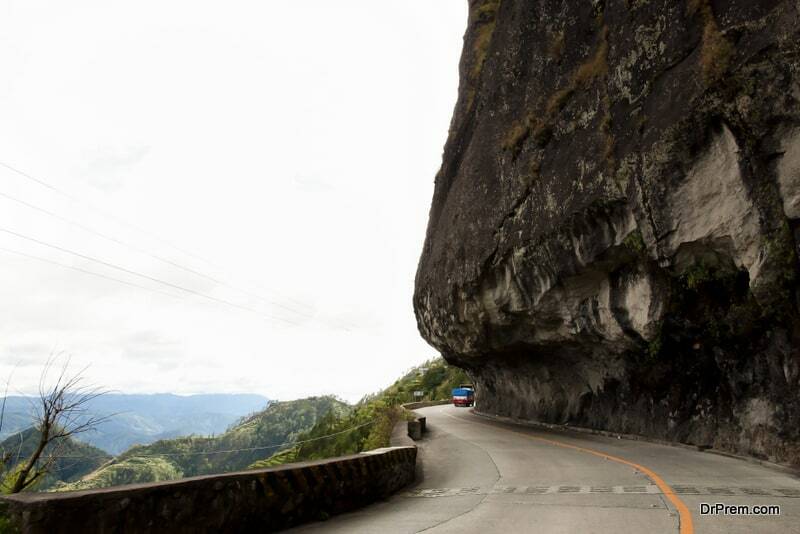 Some of the biggest drawbacks of the Halsema Highway that have made it a big challenge for drivers include 1000-feet or more drop offs, unpaved sections, no guard railings, frequent landslides and mud slides throughout the monsoon, etc. In addition, buses run at a very high speed through this narrow way, which is also precarious for drivers with small automobiles. 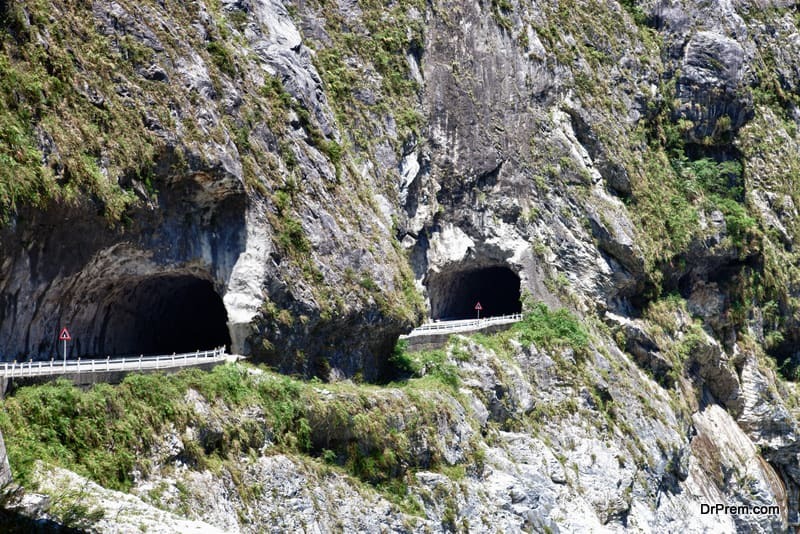 Taroko Gorge Road, the rocky highway stretched throughout Taiwan, is another important addition to the list. ‘Taroko’ is the dilect of Truku tribe and it refers to ‘magnificent and splendid’. Starting from the Dongshi district of Taichung, the Taroko Gorge Road runs through the country and meets the Suao-Hualien Highway, which is located in the eastern seashore by the side of the Pacific Ocean. There are several twists and turns present all through the way and hence, driving safely in this road is quite tough task. During natural calamities, this road remains closed by the Taiwan Government as driving along it becomes almost impossible at that time. 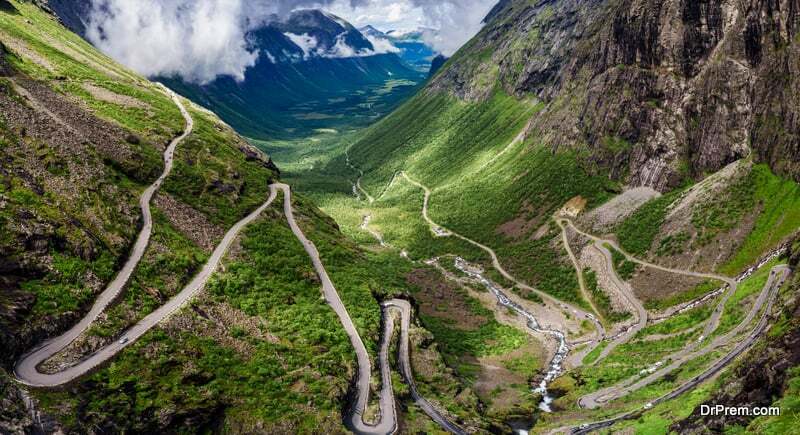 If you really want to drive through one of the most adventurous roads in the world, you have to make a journey along the Trollstigen. Situated in the Rauma Municipality in Norway, this hilly road has long been known as one of the major tourist attractions of the country. 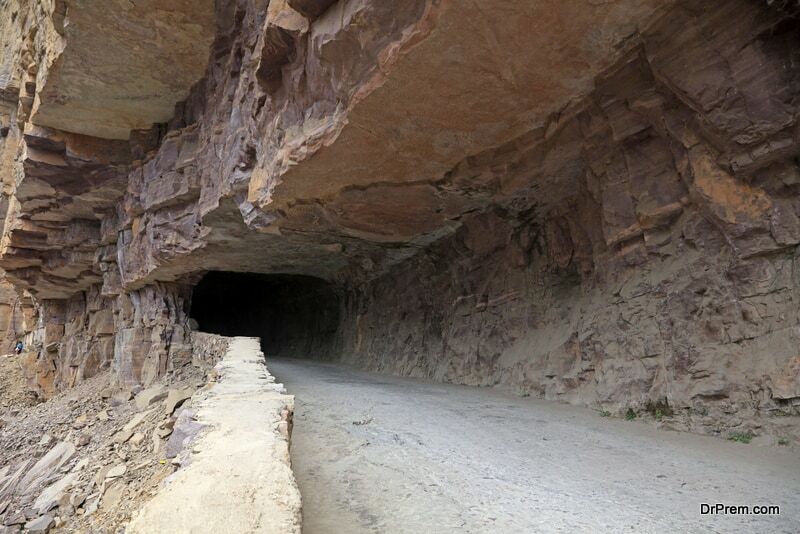 But at the same time, certain other features like extreme narrowness, vertical inclines and sharp twirls have also made it highly dangerous for the drivers. Trollstigen or ‘Troll’s Footpath’ that was created during 8 long years now works as a link between two regions, Andalsnes and Valldal. Being a tourist hotspot, it remains very congested all through the peak season. However, travelers cannot enjoy a ride through it for the period of winter and spring as it gets covered by snow. It is one of the most popular yet treacherous roads in Russia as well as in the whole world. 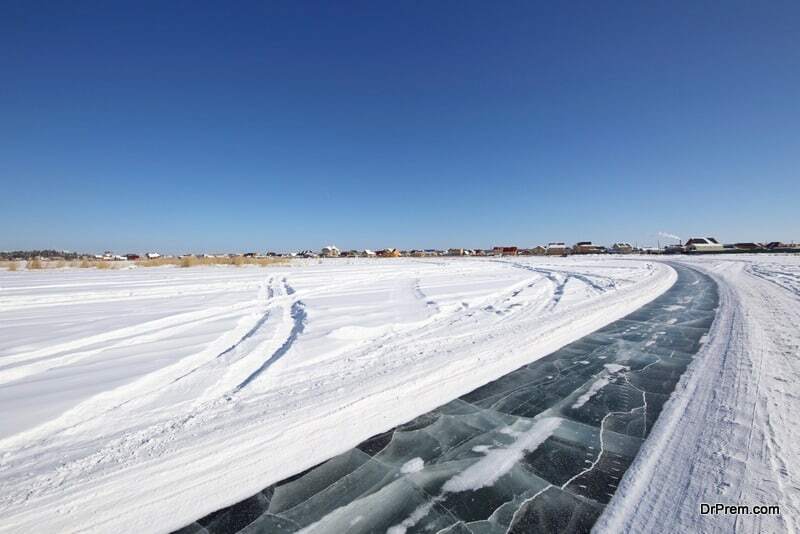 The Siberian Road to Yakutsk is the one and only road in the country that leads to the city of Yaktusk. Being a city with ultimate weather, Yaktusk remains too hot or too cold throughout the year. As a result, the road also becomes unsafe for drivers with small vehicles. It remains frozen almost 10 months in a year. Hence, you can drive on the Siberian Road to Yuktusk only for two months.